As with UPS, ARPES uses low energy photons in the ultraviolent range to probe the valence states of a solid. 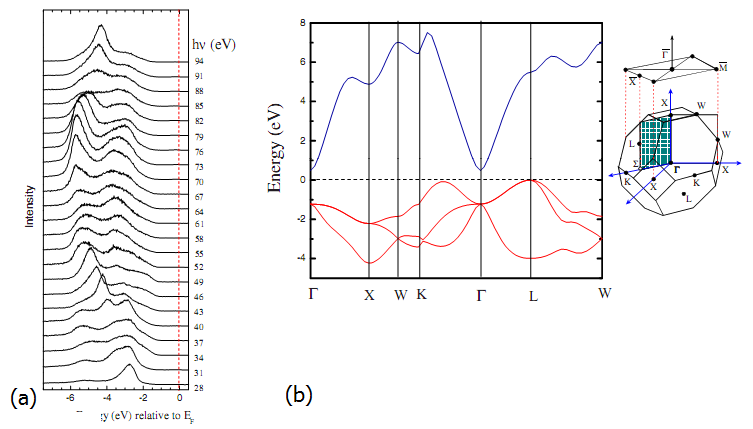 However, in addition to the number of emitted photoelectrons and the binding energy of the initial electron state, the angular dependence of the photoelectron distribution is also probed. 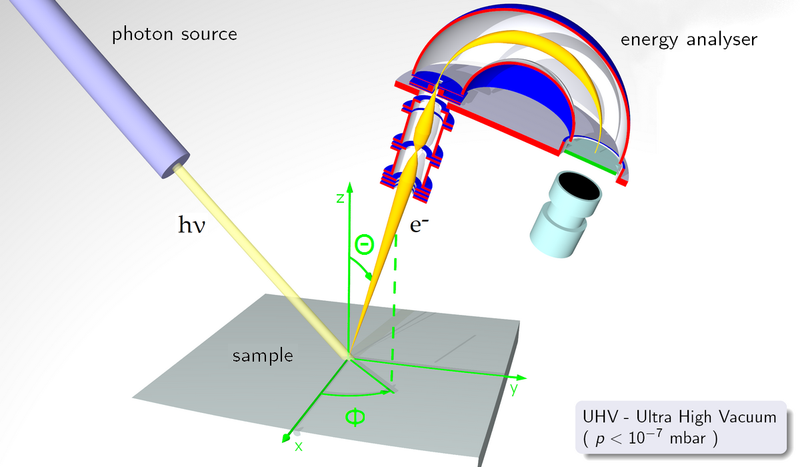 A simple schematic of the ARPES concept is shown in Figure 1.
which is typical for a photoemission process. In order to determine the angular, and therefore the momentum, distribution of electrons within the system we first must have a properly ordered single crystal. By analysing the signal strength for a given acceptance angle in the detector, and recording the kinetic energies of the detected electrons, their momentum can be determined. The components of the momentum parallel and perpendicular to the surface can then be resolved from the angle of the detector. Figure 2 shows an example ARPES plot. The position of the peaks relative to the Fermi level in Figure 2(a) and the angles they occur at provide the shape of the valence bands (in red) in Figure 2(b). The band structure has been corrected for quasi-particle effects as real systems often suffer from large correlation effects, mostly in the form of electron-electron interactions. In the case of CdO it features a large electron accumulation layer due to the low minimum in the conduction band at Γ. In order to fully model and determine the initial/final states of the electron properly, many-body perturbation theory is required.